Grand Re-Opening, May 4, 10:00 am-4:00 pm. Support the museum and community by purchasing a membership. The Robert Frost Stone House Museum is pleased to announce its participation in the Blue Star Museum program. As such, the museum offers free entrance to active duty personnel Memorial Day to Labor Day. The Robert Frost Stone House and Museum works to keep access to the house and grounds open to the public. Bennington College prioritizes experiential learning experiences. At the Frost House, students have free admission, and the opportunity to take classes with Director Megan Mayhew Bergman and visiting scholar Stephen Metcalf. We support the creation of community in several ways, including: keeping our grounds open, supporting local makers and artisans, hosting school groups, and sharing Bennington College's resources. One of the most exciting aspects of the Stone House is the preservation of a Vermont landscape that inspired some of America’s best known poetry. We are continuing to propagate apple trees from original stock while we can, and preserve historic trees, stone walls, and barns on the grounds. "Bennington College To Acquire Robert Frost's Shaftsbury Home"
"The road taken by Robert Frost through New England"
Purchasing a membership to the Frost House helps us keep the museum open, preserve the historic grounds and apple trees, and welcome school groups to the house. Benefits include free entry, retail discounts, and student-designed merchandise. Sign up here. 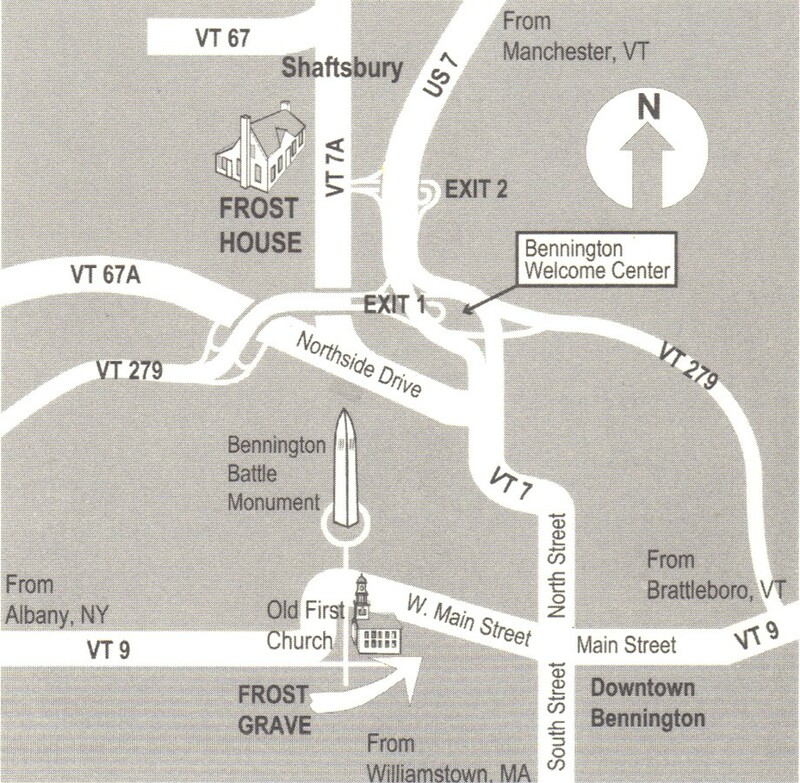 The Robert Frost Stone House Museum is a literary landmark located only minutes away from Frost's gravesite in Old Bennington. Frost resided in the house from 1920 to 1929, during which time he composed many of the pieces that became part of New Hampshire, his first Pulitzer Prize winning volume that included "Stopping by Woods on a Snowy Evening." Frost wrote the poem on a hot June morning in 1922 at the dining room table. The entire room is devoted to this American classic. The house, built circa 1769, was considered historic even before the Frost period. It is a rare example of Dutch Colonial architecture made of native stone and timber, and has changed little since Frost's time. The house sits on seven acres and still retains some of Frost's original apple trees. Interested in taking a closer look at the buildings that comprise the Museum? Students at Bennington College have created a series of 3D models. Additional photos are available for download. JJ Lankes was an important American woodcut artist and longtime collaborator with Frost. They met for the first time at the Stone House in 1924. Both men felt the representation of rural life was essential to understanding America. The Frost Stone House contains several Lankes prints as well as the custom bookplates he designed for Frost. Read novelist Sherwood Anderson's tribute to JJ Lankes here. Scholar Dr. Welford Taylor discusses artist J.J. Lankes' collaboration with Frost. If you'd like to stay in the loop, please consider signing up to receive notifications about upcoming programming and plans. As a neighbor and a notable literary figure, Frost was in conversations with the founders of Bennington College at its inception. He weighed in on one of the signature elements of a Bennington education, the narrative evaluation. In Fall 2017, Megan Mayhew Bergman taught a course on "what and who are writers’ houses for?" centered around the museum. Go north on US 7 and take Exit 2. At the end of the ramp, turn right onto Historic 7A. Go 7/10ths mile. Robert Frost Museum on the left just past the Hiland Hall School. Go south on US 7 to Exit 2. (same as above). If you come down 7A, you must go past Rt. 67 and through the blinking light in South Shaftsbury and up the hill - approx. 1 mile from light. Go west on VT Rte. 9 to Bennington and then follow directions from Bennington. Take the New York Thruway (I-87) to Exit 23. Take I-787 around Albany and exit on NY Route 7 East (Troy/Bennington). Go east on NY 7 to Rte. 279 to US 7 north, then take Exit 2 (Shaftsbury). At the end of the ramp, turn right onto Historic 7A. Go 7/10ths mile. Robert Frost Museum is on the left just past the Hiland Hall School. Go north on US 7 through the town of Bennington. Continue on a limited access highway as you leave Bennington. Take Exit 2. At the end of the ramp, turn right onto Historic 7A. Go 7/10ths mile. Robert Frost Museum on the left just past the Hiland Hall School.